For 100 years, the legendary Isle of Man TT Mountain course has played host to motorcycle racing. 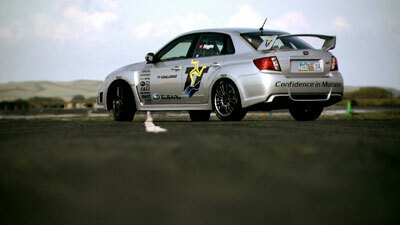 In 2011, to mark the circuit’s centenary, Subaru organised an epic challenge – to set the fastest-ever four-wheel lap of the 37.7-miles of twisting public roads. A near-showroom condition Subaru Impreza STi with road-legal tyres was chosen for the mission and three-times British Rally Champion Mark Higgins selected to pilot the 305bhp, 160mph-plus car around the narrow roads of his native Isle of Man. Jaw-dropping footage brings you the full story of the bid to shatter the record set 21 years earlier by rally legend Tony Pond, and it is a white-knuckle thrill-ride of a story which will have you on the edge of your seat throughout. Multiple on-board cameras show hedges and wall flashing past, just inches from the Subaru as it blasts through villages at more than 140mph and accelerates on to more than 160mph. Aerial and trackside cameras ensure you enjoy the full experience, while on-screen graphics show you the time, speed and position of the car as the drama unfolds around the iconic Mountain course. The Pirelli P-Zero tyres squeal for mercy as Higgins pushes to the limit; sparks fly as the brakes burn red-hot; pavements disappear under the car as corners are cut in bustling towns and villages; and you will leap back from the screen as the Subaru power-slides toward famous TT landmarks! Throughout, Mark Higgins provides detailed commentary, including what he describes as ‘the biggest moment of my life’ – quite a claim given his long and illustrious rally career! The Subaru Challenge set a new benchmark – an average speed of 115.356mph around the TT Mountain course – and this is the complete story of how it was done. Bonus features include both 110mph-plus practice laps, with commentary from Mark Higgins, and a look at the ‘stock’ Subaru which took on the TT Challenge – and won!